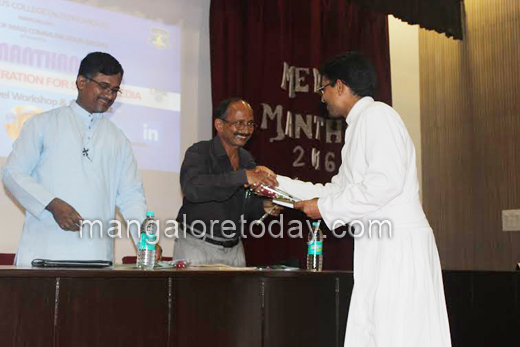 Mangaluru, Jan 20 2016: The first day of Media Manthan 2016 – the two day National Workshop and Media Fest was held on 18th January 2016. 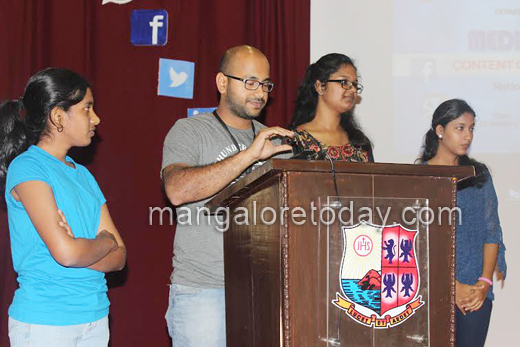 This was the seventh edition of the flagship event of the Department of Mass Communication, St. Aloysius College. 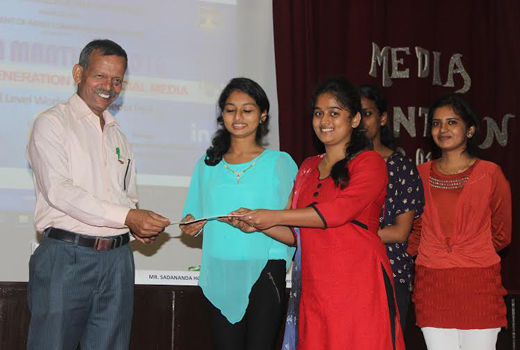 The theme for Media Manthan 2016 is ‘Content Generation for Social Media’. HOD Vishal Nayak welcomed the guests. 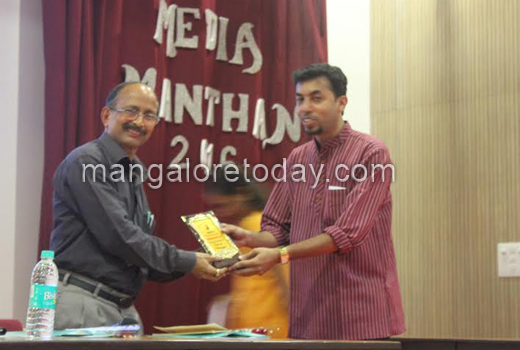 The Chief Guest for the inaugural was Mr.Khader Shah, the Information Officer, Dakshina Kannada District. In his speech he said that Social Networking has become a part of our life. 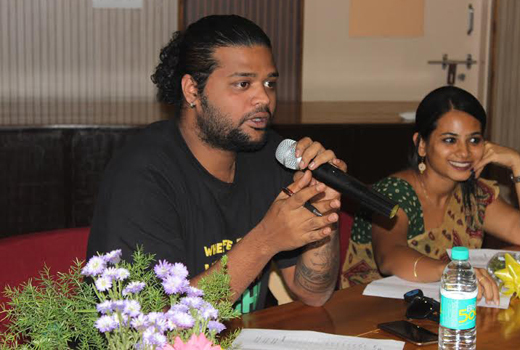 “The media penetrates all parts of our life and reflects on the youth,” he said. Rector Rev. Fr. 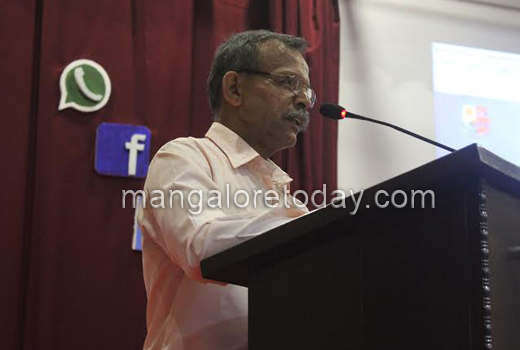 Denzil Lobo SJ in his presidential address stated that we are hungry for news. “The media industry manufactures and provides information,” he said. He stated that it is important to create useful information that will help us in day to day life. Vice Principal Rev. Fr. Francis Almeida also delivered a speech. 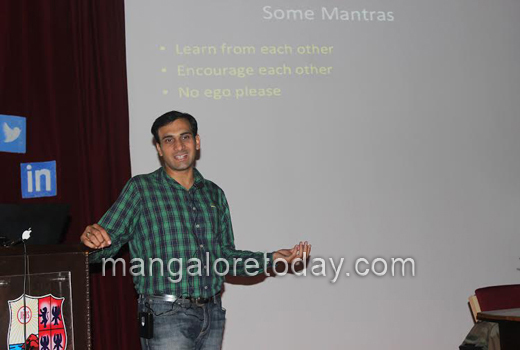 The keynote address was delivered by Mr.SaurabhChaterjee, a renowned photographer from Hyberabad. A photographer, avid traveller and academician, he shared his knowledge of photography, opportunities in the field, career options in photography and various genres that the students can possibly explore. He further informed the students how a hobby can be developed into commercial photography and eventually a business. He told the students the importance of creating a social media presence and eventually creating a brand. The students were briefed on the various social media handles/apps that can be used by photographers and how one can establish oneself by focussing on uniqueness and niche genre. His speech was followed by a quiz. During his afternoon session on Digital photography and photojournalism, Mr.Saurabh stressed upon the importance of patience and hardwork. “You need to believe in miracles. If you wish hard enough, your wish comes true,” he said. He further explained the student’s basics of photography, lighting, rules of photography and also taught the students tricks for getting a better photograph. Mr.Saurabh shared insights from his travel experiences and photo shoots and explained how he made each photograph look different by adding o subtracting certain elements. He informed the students the importance of hashtags and how one can earn by pursuing photography part time. 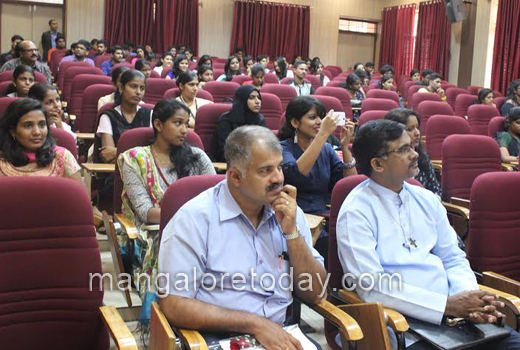 The workshop was followed by competitions for the students. 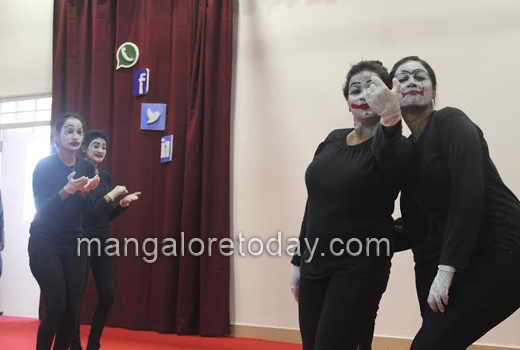 The students enthusiastically participated in Stress Interview and Mime competitions. The preliminary round of the quiz was held as well. 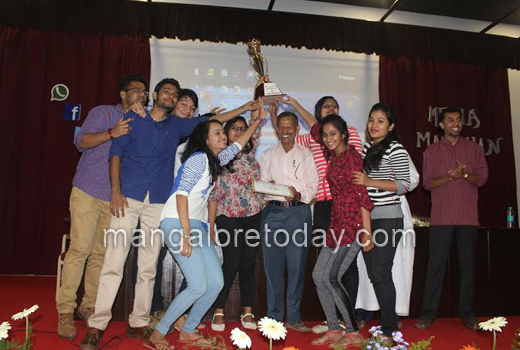 The second day of the National Workshop and Media Fest – Media Manthan 2016 came to an end with Alvas College, Moodbidre bagging the overall championship for the second consecutive year while SDM College were the first runners up. 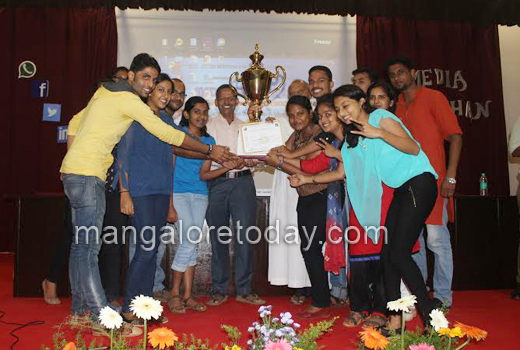 Green Valley Academy Malappuram, Kerala bagged the second runners up. Thanks to Media Manthan. Wonderful Photographs of students posing. The over all study of Photography, Journalism and many more interesting topics. Media Manthan some thing interesting. A entertainment education program me which imparts knowledge.Congratulations to all the participants and the non-participants too.